Are You Ready For July 2018? With the latest announcement from Google confirming that speed will be a ranking factor for mobile search results from July 2018. This means that speed is more important than ever. Luckily, this gives users and developers time to make sure sites are in the optimal position to rank well when the “Speed Update” rolls out. 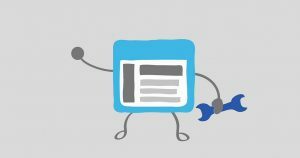 Use Google PageSpeed Insights tool; which has recently been updated to use data from the Chrome User Experience Report, to identify areas of your site that can be improved. PageSpeed insights allows you to input a URL which is then checked and given a score out 100 based on a number of different factors for both Mobile and Desktop. Webmasters can use the information given to help improve your sites performance and experience for your users. There is currently the PageSpeed Insight Tool within Google that allows you to enter a URL and check the speed and optimisation of that landing page on a mobile or desktop. It has recently been updated to use data from the Chrome user experience report to determine what the page speed is on both platforms. Not only does it provide information on page speed but also based on real user statistics which is an important element for user satisfaction. Pages are graded by levels, these being; Fast, Slow and Average. 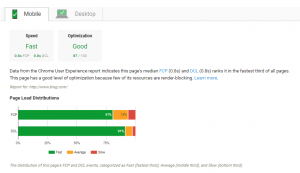 Fast is the average value if the metric is in the fastest third of all page loads. Slow is the average value if the metric is in the slowest third of all page loads. Average is the central value if the metric is in the middle third of all page loads. An optimisation score is also displayed which falls under three positions; Good, Medium and Low. There is also a Page Stats part that can determine if the page might be faster with modifications made to the appearance and functionality. Although some sites may experience a downgrade for being really slow, there is no increase for having a fast loading page. Google has stated that only a minimal amount of searches will experience the impact of this update, however it’s a way for more businesses to implement Accelerated Mobile Pages (AMP), which is technology that loads pages quicker. The objective of this update is to improve the search user experience regardless of which technology you are using. If an AMP website delivers a slow experience, this may impact on its ranking, unless the content on page is of a high standard. The “Speed Update” stems from a switch in focus from desktop to mobile searching. With over half of all searches being carried out on a smartphone we can expect more updates in the future relating to speed and user experience. Of course there is more to ranking well than just having a quick site, it’s important to make sure you are creating relevant and engaging content for your users, think about user intent and what can help you stand out from the crowd. Ⓒ The Covey Agency 2019. All Rights Reserved.